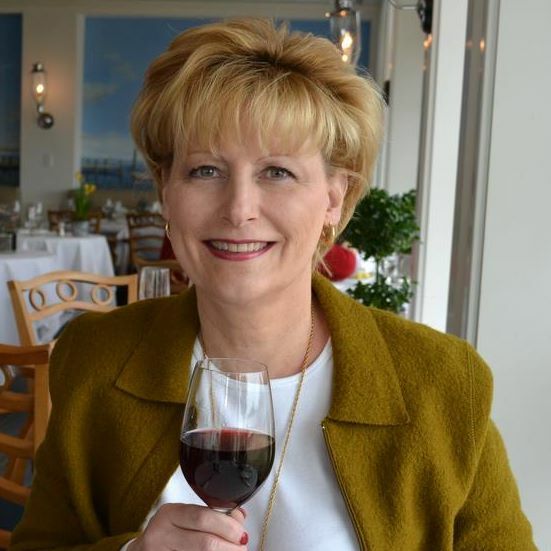 The February Desire to Inspire Challenge was accepted by Katie Wyatt. She had just a little less than a month after getting her fabric from the Dana Brooks "Little Red Hen" collection to do something fabulous. And fabulous was what she did!!! HG: Where do you live, and what is it like there? I live in the historical town of St. Michaels located on the eastern shore of Maryland. My husband and I have been here for 18 years - prior to that we lived in Bethesda, Maryland. St. Michaels is know as the ‘Town that Fooled the British’ in the war of 1812. St. Michaels has quaint shops, great restaurants, The Chesapeake Bay Maritime Museum, the lovely Inn at Perry Cabin by Belmond hotel, and all the blue crabs you can eat. HG: Share a little about your family and what you like to do together? Wilson [my husband] and our two adorable Westies [Julep and Derby] enjoy walking around the town of St. Michaels. We have the harbor area on the Miles River and plenty of historical homes scattered around town. A favorite vacation spot [although we live in a vacation spot] is Duck [on the Outer Banks] of North Carolina. Here we rent a pet-friendly home. Since this is a ‘driving’ vacation I pack my sewing machine and a nice stack of fabric. We are also photographers and enjoy taking pictures of nature as well. 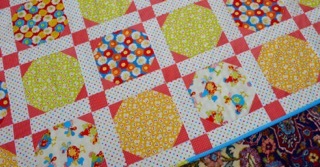 HG: Share about your quilting journey... how long have you been quilting, what is your favorite technique or type of quilt, and who taught you? 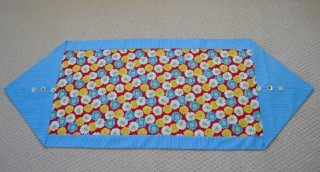 I started to sew in the early 70’s when Home Economics was taught in school. My aunt was my inspiration then ... watching her sew Barbie clothes. Taking a long break from sewing I started again with inspiration from my sister. When she found out how much I paid for a simple dog bandanna she told me she could make them so much cheaper. The next thing I knew I was buying a sewing machine to make dog bandanna’s. I lost count but I made approximately 1,000 reversible dog bandanna’s which I donated to Westie rescue groups [in the US & Canada]. The rescues used the bandanna's for fund raising or to put on a dog when it was ready to go to to their forever home. 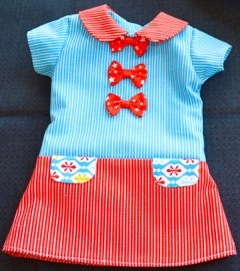 This step turned into making American Girl doll clothing - another sewing project inspired by my sister. 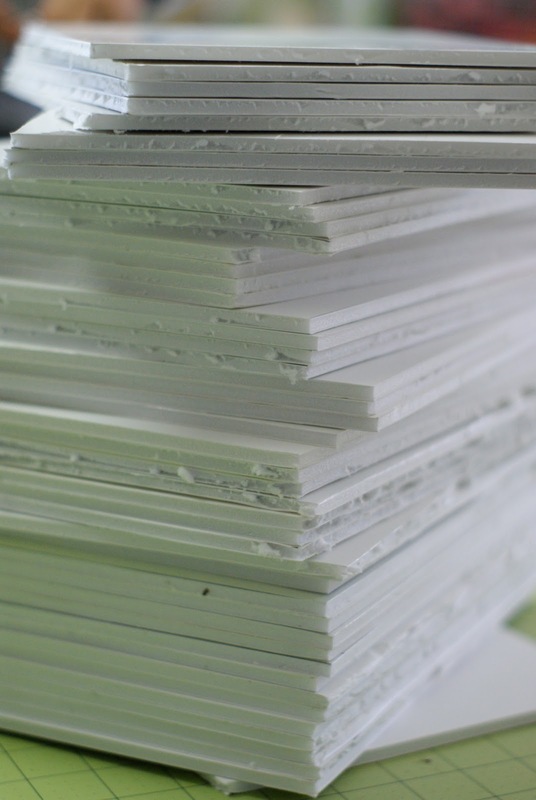 My quilting journey started when I met a lady at our local fabric store with a stack of quilting books. We started talking and she invited me to the next quilt guild meeting. From that point I was hooked. 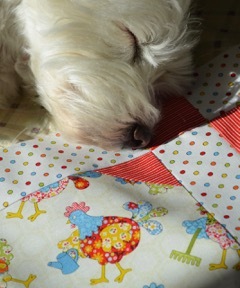 Now I make quilts to donate to Westie rescue auctions on Facebook. It’s my way of helping get a Westie get the medical attention it needs. I have donated American Girl clothing to rescue auctions as well, but for most part I give all these away. 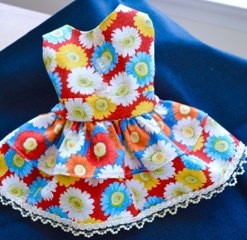 It makes me happy to see the look on a little girls face when she opens up a box of custom made doll clothing. 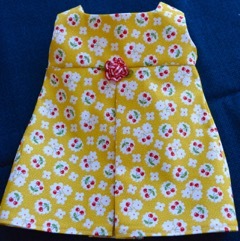 The following pictures are clothing for American Girl dolls that Katie makes and gives away. HG: Want to give a shout-out to your guild? 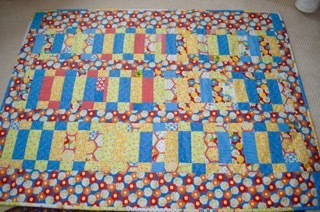 I’m a member of the Bayside Quilters guild of the Eastern Shore [baysidequilters.com]. Our guild is very active with monthly meetings including guest speakers, classes, and various Bee’s. The Community Outreach portion of the Guild meets monthly as well. One program I’m particularly fond of is the Outreach donation of over 400+ Christmas stockings in various sizes to the Marine Mom’s in Bethesda. These are then filled with goodies and are sent overseas to the troops. Outreach also donates many many quilts to various groups and individuals - it’s too many to list here. I have a love affair with fabric [don’t tell my husband or the Westies!]. I’m inspired by the creation of others as I hope others are inspired by my creations. I do a lot of sewing and in order to keep track of what I made I started a blog just for the photo's [www.katiesews4fun.blogspot.com]. My other blog [www.westiejulep.blogspot.com] is my everyday life blog. Feel free to visit anytime. In closing, I would like to thank Henry Glass Fabrics and the ‘Desire to Inspire’ contest for choosing me as the February winner. 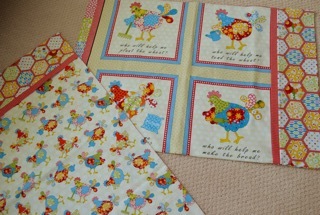 Working with the Little Red Hen Collection of fabrics by Dana Brooks was a pleasure. 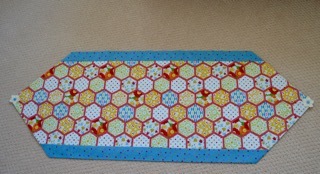 Used the Panel for Pillowcases! A big thank you to Katie Wyatt for doing such an AMAZING job with the Desire to Inspire Challenge. Here she is - Katie Wyatt. Enjoying herself at the beautiful Inn at Perry Cabin. The next Desire to Inspire challenge will be posted TOMORROW. What will you do? Are you ready to accept the challenge? 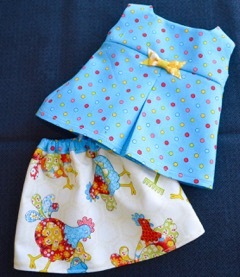 Sneak Peek of Monday's blog and giveaway! 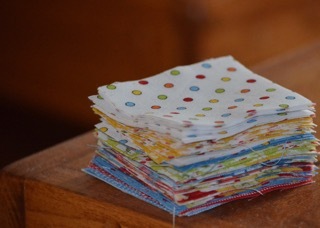 A stack of 2-1/2" squares, just over an 1-1/2" high. That's it! Please stop by the blog on Monday to see what Katie Wyatt did in those short three weeks, and she has a giveaway of her own!!! This is an essential tool to quickly seeing everything that is new and newsworthy in the quilting and sewing world (or any world for that matter). If you have not done so, go quickly to www.bloglovin.com and set up an account for yourself. 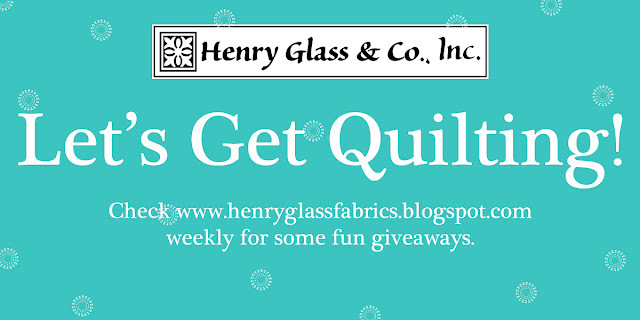 Then, ADD http://henryglassfabrics.blogspot.com/ as your first blog to follow. What you will get everyday, on your phone if you download the Bloglovin' app, or online when you go to the site, is a running roll of all the blogs you follow. You can read them right there and then, or you can Save them for later. You can Mark as Read so they don't show up in your feed again, and you can search out other blogs that may interest you quite easily. Here is a screenshot of a running feed. It has just the first few lines, plus a picture from the blog so you get an idea if you're interested to read further. .
Now, after you have gotten BlogLovin' set up, and are really wanting to add your favorite quilting blogs to it, I have curated a list of over 500 blogs of quilters, sewers and crafters that we follow on BlogLovin' to give you a head start. You are welcome to use the many hours of curating efforts we have spent to start your own blog feed on BlogLovin'. 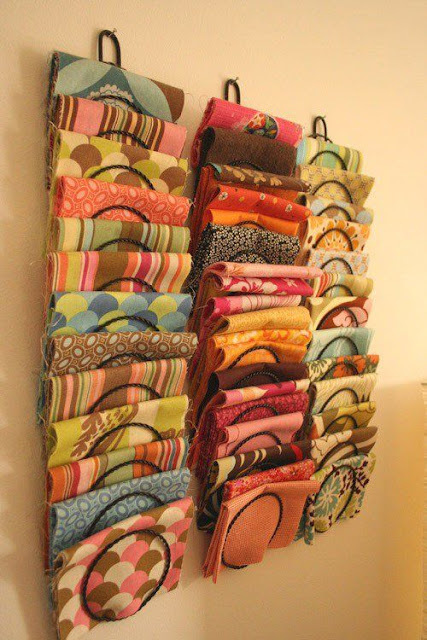 If you are interested in my list of over 500 blogs of quilters, sewers and crafters, just comment below, with a YES. Only the first 50 people will get this list. But you are welcome to share it with your friends as much as you would like. After I send you the list, I promise I will delete your email address. Dreams of Paris. Soft sunlight in the afternoon. Lush, verdant banks along the Seine with emerging springtime buds. These are the pictures of this weeks giveaway. A collection found now in your local quilt shop called "Stroll Along the Seine." This collection is from Mary Jane Carey of Holly Hill Quilt Designs. Please enter to win the giveaway below, and come back next Monday to see if you have won. As a consolation prize, just for entering (or just for stopping by the blog) you can have this free project that was created for the "Stroll Along the Seine" collection. Let's Get Quilting - 2016 "Stroll Along the Seine"
Oh to be in Pasadena this weekend! Full of envy that a bunch of cool, hip and immensely talented quilters are there having a great time, and seeing very cool work. "The denim in this quilt is from my brother Michael's work jeans, which I rescued from the dumpster after his suicide in 2009. I improvisationally pieced the crosses, which resemble a variation on the traditional nine patch. The pale ground includes subtle gold and white crosses. 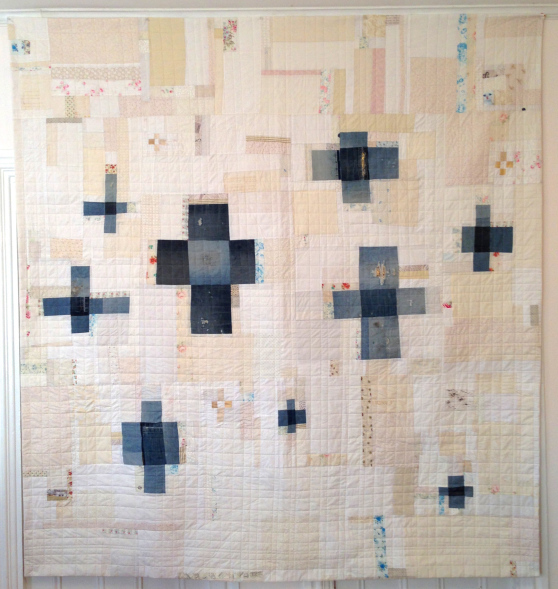 Grid quilting creates echoes of the cross motif, as well as references my brother's work as a tile installer. I tucked vintage gold ribbon behind some of the tears in the denim. 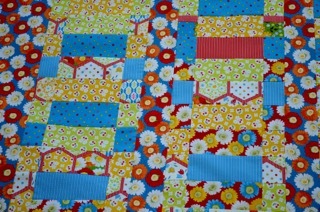 This quilt was a joy to work on, as I love worn materials and find beauty in forgotten and discarded things." 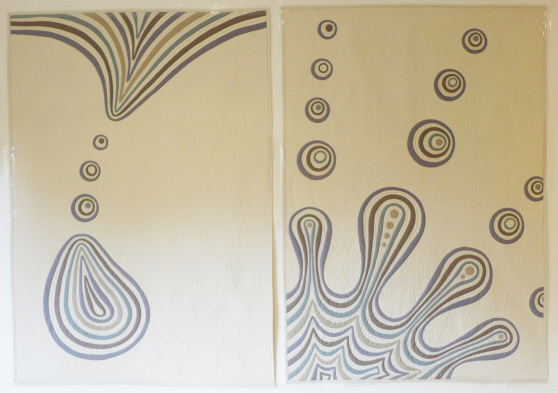 Here are a couple other outstanding highlights, the winner of the Quilting Excellence Award. Here is first place award winner for Modern Traditionalism. 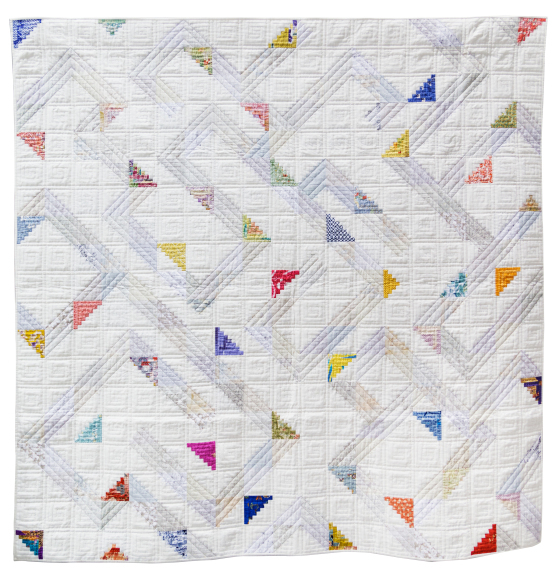 Go see all the great winners for yourself on the Modern Quilt Guild blog, and a warm Congratulations to the winners! 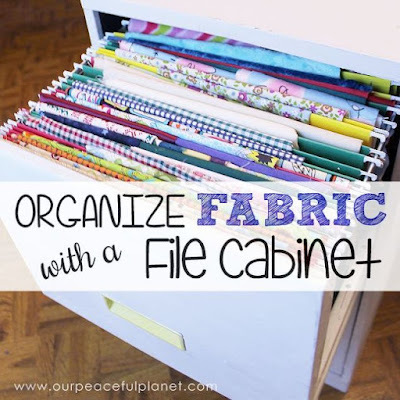 Time to clean up that stash and make your fabric storage tidy (because when it looks like we have less fabric, we know we need to go get more). 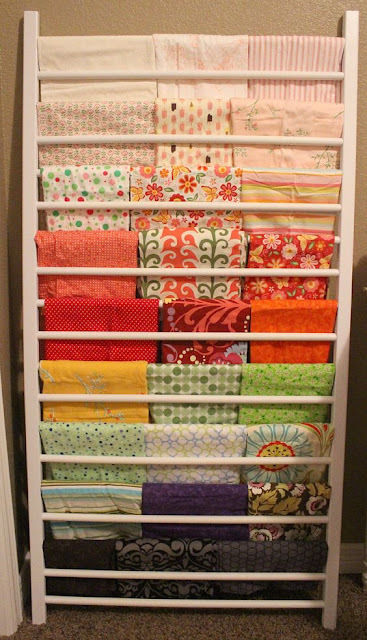 So here are a few fabric storage ideas curated from Pinterest, just in case you are to busy sewing to get over there and take a look yourselves. The link is below each picture if you want to see the source. Love the tension rods, and the neat folds of fabric. How about an inexpensive cutting table made with 4 - 9 cube organizers. Can be topped off with a couple of hollow core doors too! Credit goes to GeorgiaPeachez on Pinterest but the link is broken. 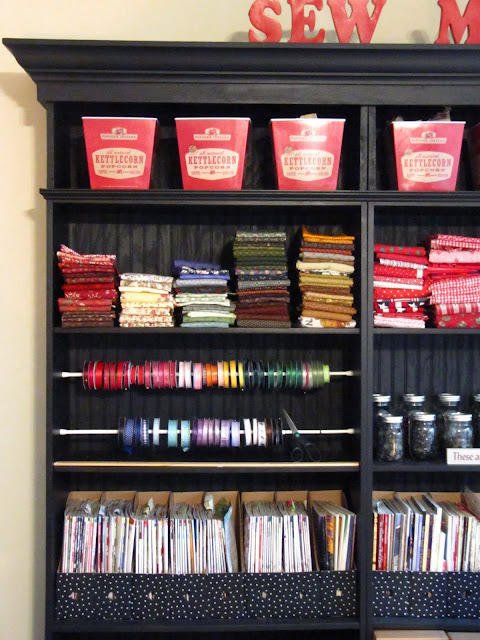 Of course we like to display the riches of those fabrics too! Grab that old baby crib and use the rails! Not collecting plates anymore, just fabric? Check this out. This is totally how to do it. 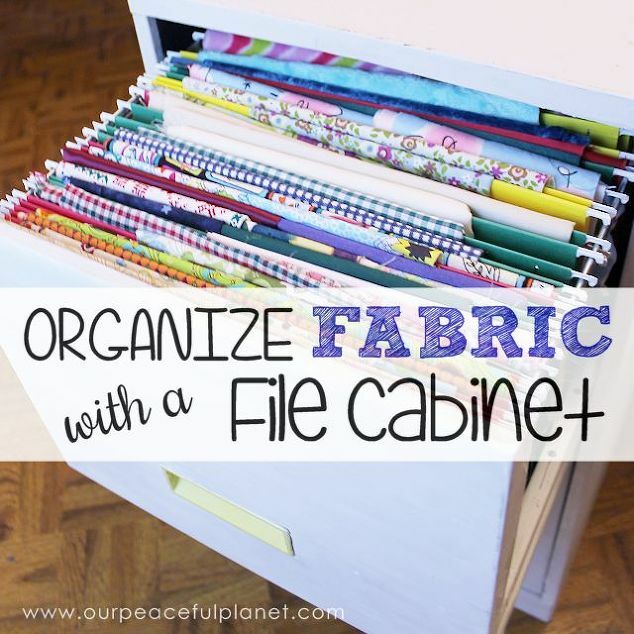 And of course, you can file your fabric under F in your filing cabinet. And finally, you can take your kids science project foam core boards, and cut into squares to make your own mini bolts. What new ideas do you have to store even more fabric?? We checked in with Henry Glass designer Leanne Anderson recently and she gave us a few minutes to share lots of exciting developments from the Whole Country Caboodle. First, here's how you may know Leanne and her daughter Kaytlyn, from this new collection, called "I Love You This Much." And this one Leanne and Kaytlyn created together called Whispers of Wisdom. In the collection are faith based sayings that encourage and inspire all ages. Talking to Leanne one hears her faith in action, as she confidently shares the plans for her business, she also just as confidently shares her faith walk as the family has struggled this past year with her son's cancer, the passing of a dear relative, and postponement of several business goals. While it may be that she has struggled through a darker season, the light is now coming through as there are several major exciting plans in the works for the Whole Country Caboodle. The first and most exciting for quilters is that Leanne and her husband Ed have been busy building a quilter's retreat on their property. Idyllically located in the countryside of Nashua, Iowa. Nashua also happens to be the home of a famous historical church, "The Little Brown Church". 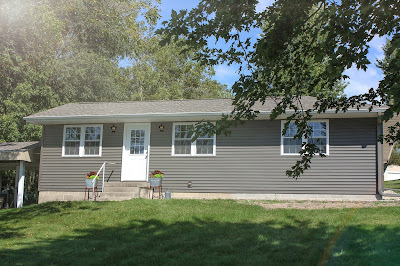 So the quilter's retreat housing may also serve as a respite for families who visit Nashua for nuptials. The quilter's retreat has two bedrooms, and is just a stone's throw from Leanne's quilting studio. So guests can enjoy some quiet retreat and relaxation right next to the lake on the property, and then step into a guided or unguided teaching session with Leanne. Leanne says she is just as open to people just coming to work on whatever project they want as to give a 'lesson' or two on quilting. Just bringing women together to share heart stories and rest in God's peace is what is most important to her. "The goal of this retreat cabin was never to make money" she shared. "It has always been about giving back to others what Ed and I have worked so hard together to create." That is evident in the name that has been bestowed upon the open concept cabin, "Sow in Peace." A fun play on words, and a nod to James 3:18 that says: "Peacemakers who sow in peace reap a harvest of righteousness." A tiny little blessing for those who may travel here. Leanne says that she can see this being a hub for other designers and quilters who may want to come and teach their own classes. She and Ed have lots of ideas that have been born from lots of conversations with customers, quilters and friends about what they would like to see in a destination such as this. And they have built as much as they can into the finished product. And this is the view. The opening of the "Sow in Peace" retreat is scheduled for April, but Leanne shares that it is all in God's timing. Also slated for this spring is a whole new website, which will include scheduling for the cabin, as well as continued focus on e-commerce. "Kaytlyn has been the driving force behind the new website," said Leanne. "She is really the technology brains behind us now. She helps with getting the drawings into Illustrator, and adding colors. She works with me just two days a week, and has another graphics position at the church we attend." Kaytlyn and Leanne built the "I Love You This Much" Collection together. "Creating it was full of giggles and fun the whole time. Dinosaurs are a timeless icon, they just don't go away," said Leanne. "Whimsical or real, it was our twist on the designs that they would portray a positive message of love even through the eyes of a funny dinosaur." And we think it does too, Leanne! Here is a giveaway from a collection by Whole Country Caboodle called "Build Each Other Up"
Our Desire to Inspire Challenger is Truly Inspired! We certainly love it when we can make someone's day! 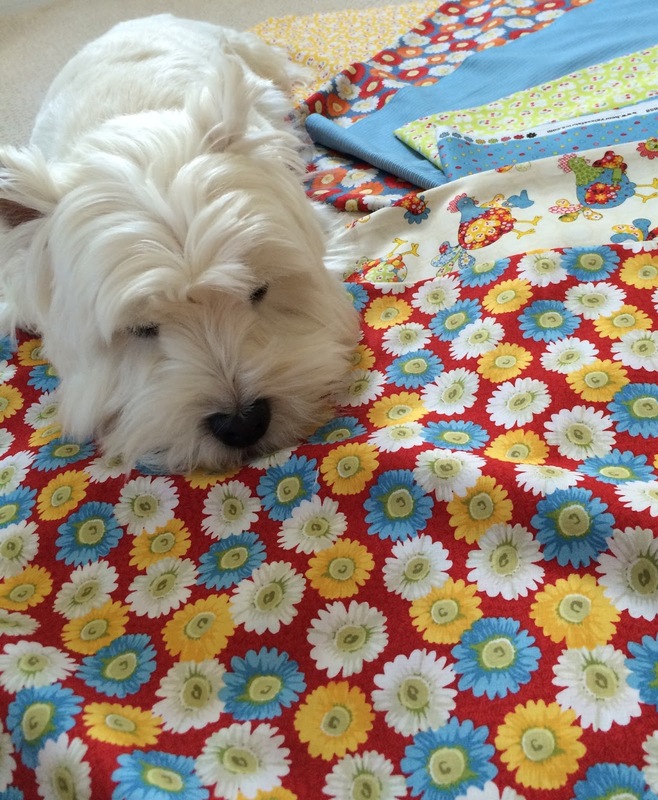 The Desire to Inspire Challenge was accepted by Henry Glass fan and blogger, Katie Wyatt, and when her "Little Red Hen" fabrics arrived both she and her darling Westie, "Derby", fell in love. 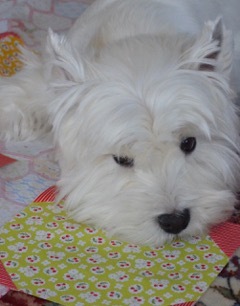 Who doesn't love a picture of great fabric and a darling Westie that wants some love? 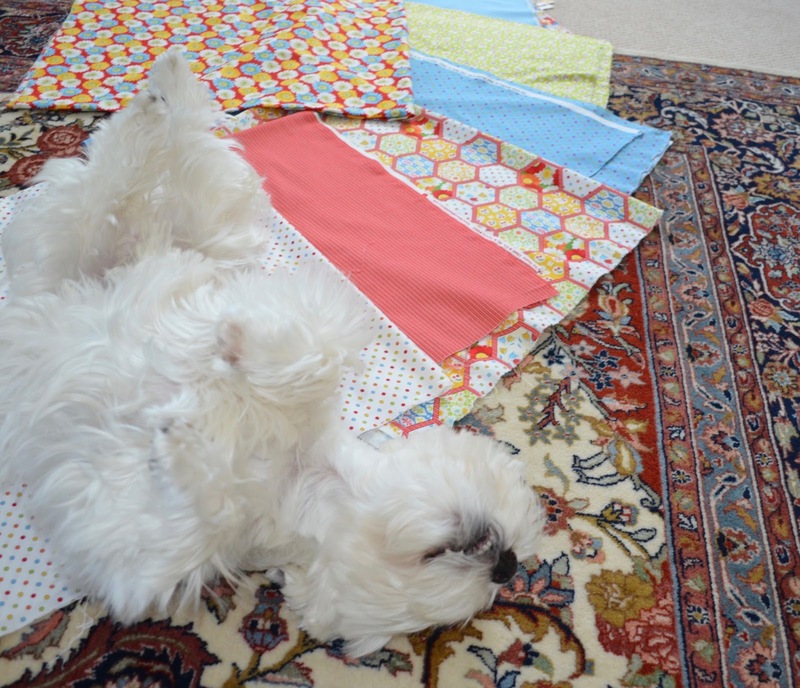 No time for belly rubs Derby, Katie has some sewing to do! Check back on February 29th to see how this Challenger met the Desire to Inspire Challenge! Let's think spring! This giveaway is for the Berry Cobbler bundle, 5 pieces of the collection designed by Elena Vladinka. See the cute project that was designed with this collection HERE. 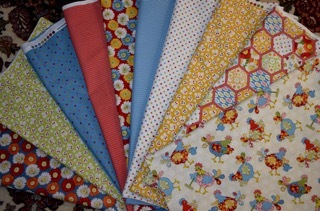 As you may recall, we did a post about Little Quilts and Mary Ellen Von Holt's fabric line, the Roswell Mill Collection and the new line from Little Quilts, Savannah Garden. Well, Mary Ellen has been kind enough to offer up a special giveaway of one of her books, that she will autograph to the winner, and send along some Little Quilt patterns too! This is a FLASH FRIDAY FUN giveaway, though we will extend the deadline for accepting entries until Monday morning. We have selected a winner for the February Desire to Inspire Challenge, it's Katie Wyatt! 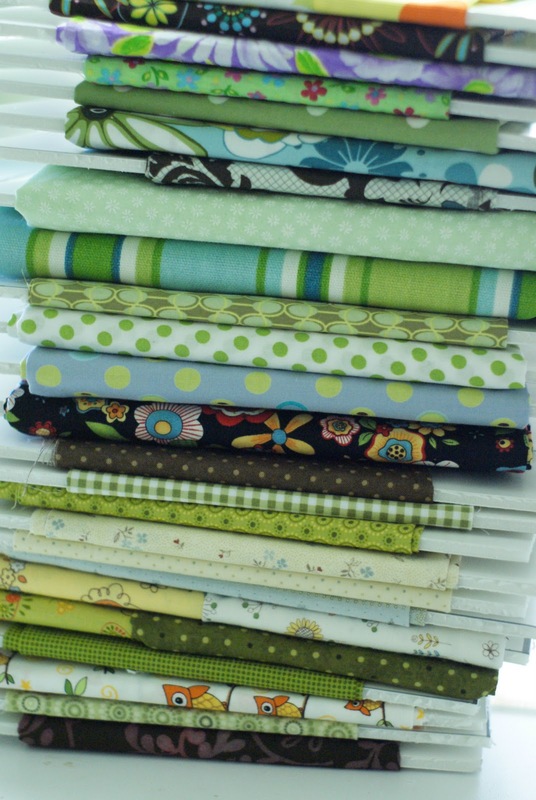 Katie, we will send your fabrics to you this week and you have until February 29 (Leap Day) to send us your project pictures! Thanks for taking us up on the challenge! 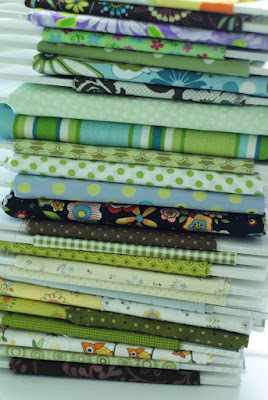 For the next giveaway, we are offering up this sweet bundle from the Audrey Collection by Color Principle. 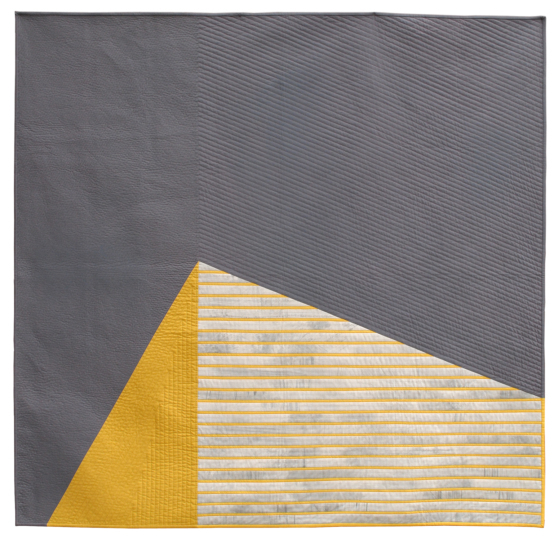 Yellows, whites and grays are perfect for winter quilts or for bringing in the springtime sunshine. Either way, it's free to you if you win! To enter, just leave a friendly comment for the designers at Henry Glass to give them all your boost of sunshine, and we will pick a winner next Monday. You have until Sunday night to enter.